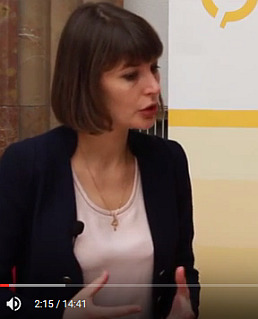 In a video interview, Daria Kaleniuk, Executive Director of the Ukrainian Anticorruption Action Centre, grants insights into the anti-corruption work of her centre. The Ukrainian Anticorruption Action Centre in Ukraine (AntAC) is a Ukrainian civil society organisation which unites experts from the legal, media and civic-political sectors fighting corruption as a root cause of the key state-building problems in Ukraine. Since its establishment years ago, the Centre has become an important institution in this vital area of reforms and in the political economy of Ukraine. At the 78th East Jour Fixe of the Oesterreichische Nationalbank (OeNB) on 'Ukraine - progress of reforms and challenges ahead'. which was organised in cooperation with wiiw, Daria Kaleniuk gave an inverview to wiiw Scientific Director Michael Landesmann.